The collaboration between both German companies has allowed to integrate to the wide porfolio of mechanisms and electrical systems of Jung‘s automation, Siedle‘s complete catalogue of intercoms and videoporteros. 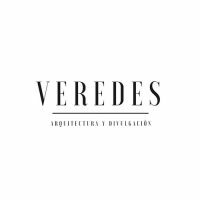 The extensive catalogue of products includes also apps for smartphones, the system of mobile intercommunication Scope de Siedle and complements like mailboxs or systems of control of accesses and lighting. The synergy between Jung and Siedle supposes for builders, architects, interioristas and prescriptores a great advantage at the moment of designing and to implant global solutions of electrical control and intercommunication in buildings of any typology, from floors or one-family residences to offices, trades, etc. The devices of Siedle’s exterior communicate with Jung’s interior stations by means of the bus In-Home, which allows to create made-to-measure facilities overcoming in addition in functionality and safety the systems independent from traditional intercoms. Likewise, the integration of the system of building automation based on the standard Jung’s home automated KNX with the intercommunicators of Siedle, it adds a bonus of efficiency and safety to the installation. For example, by means of screens Smart Pilot of Jung, the users can have the control of the whole system within reach at any time. Beside acceding to all the functionalities of control and management of the electrical system, if someone calls to the door, in the display a window will be opened by the audio / video from Siedle’s exterior station placed close to the entry. 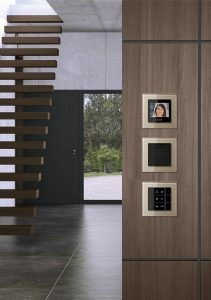 Besides the typical functionalities of any intercom, since talking with the visitor or to open the door, the user will be able to send the call to another Smart Pilot of the house in order that others speak or identify whom it calls. In addition, in case of has nobody in house, the images and the audio can avoid automatically to check later the received visits. The Configurator online of Jung. On the other hand, an effective web tool, the Configurator online, allows to plan, to calculate and to visualize the complete system of intercommunication. Available in the web sites of Jung and Siedle, the application facilitates stepwise and of totally visual form, the creation of an installation of alone audio or combined with video or with such elements as keyboards, loudspeakers, displays, etc., that can be organized in the only block or separated, arranged horizontal or vertical form. The selection of the model of Siedle’s exterior station who better adapts to the installation, is also a simple process that follows similar procedures. 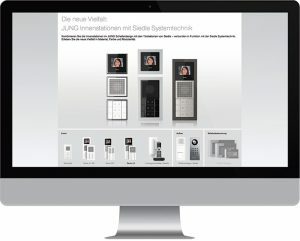 The Configurator online allows to visualize all the possibilities to harmonize the installation with the decoration using the enormous variety of materials, colors and forms, typical of the available series of Jung’s mechanisms. 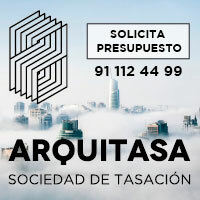 This way, anyone that is, the wished configuration of mechanisms or elements will adapt harmonious to the stations of videoportero available interiors, from the modern purism from her A Creation up to the demanding atemporalidad of the classic LS 990, spending for LS’s showy combinations bonus.